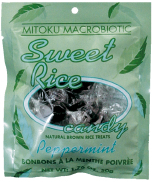 Natural Import Company - Traditional Japanese foods - Mitoku Peppermint Candy - 1.76 oz. Mitoku Peppermint Candy - 1.76 oz. Ingredients: traditional rice malt (whole brown rice, sprouted barley, spring water), natural peppermint essence. The popular spiciness of ginger and the cool, clean minty-taste of peppermint make these flavors a must have, especially with adults. These two "hot" flavors have remained two of our best sellers since their introduction over 25 years ago.